Premier Rachel Notley says Alberta is willing to buy the Trans Mountain pipeline. Here’s what taxpayers would get. For sale by owner: one antique oil pipeline. Plenty of mileage on her but she’s still running. Built in the good old days, before “Indians” were allowed to hire lawyers. 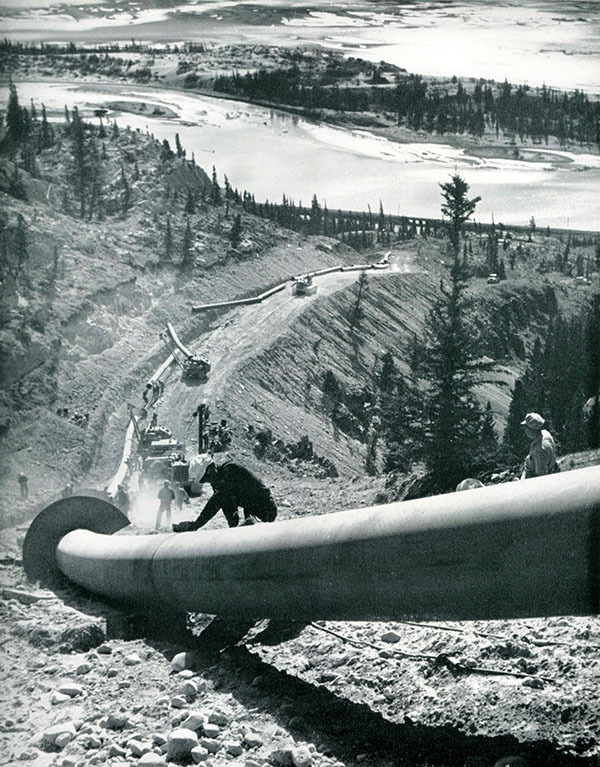 Pipeline includes a right-of-way through 15 B.C. reserves. Lining up and welding at Windy Point in Jasper National Park. Comes with a vintage Korean War-era tank farm. City of Burnaby not exactly as pictured. Burnaby Terminal near Vancouver, with Burrard Inlet, Vancouver Harbour, in the distance. Reliable as they come. Only 69 oil spills since records started being kept in 1961. 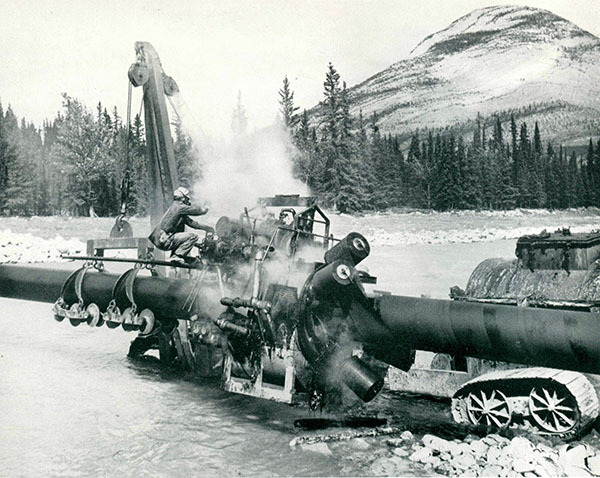 Coat-and-wrap crew bogged down in muskeg east of Yellowhead Pass, Alberta. Some rust. Pipe walls might need extra wrapping in some places. A great fixer-upper! Wrapping machine applying protective covering at Snaring River, Alberta. Be careful running diluted bitumen at high pressure through a pipe this old. 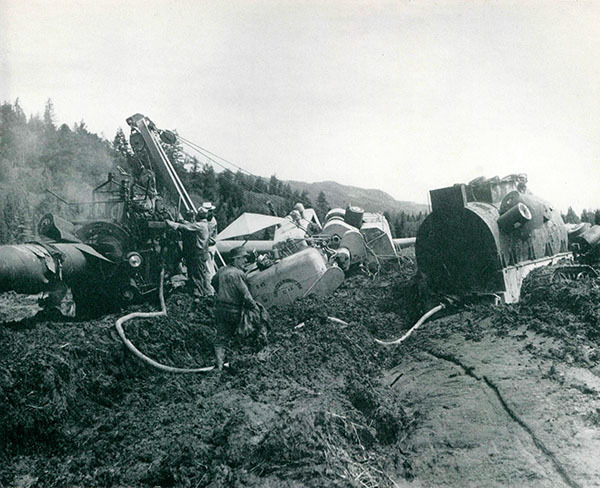 If you have a blowout near a river, budget a few billion dollars for attempted cleanup. 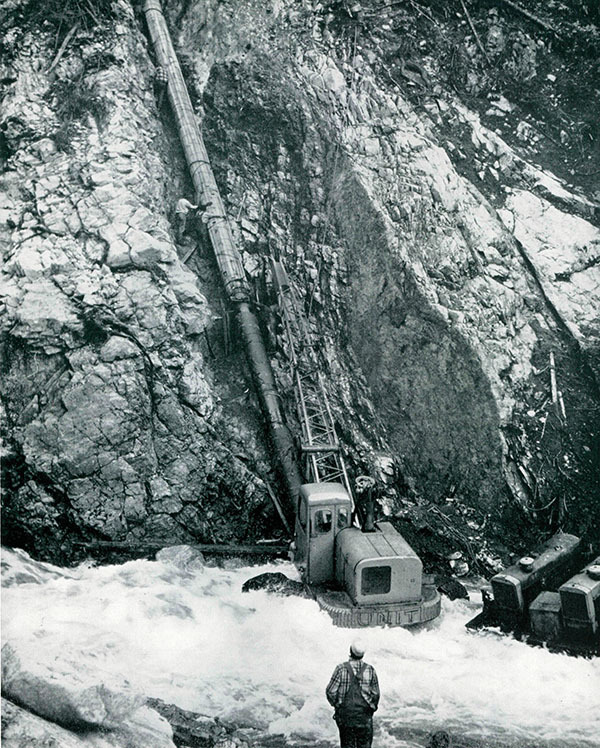 Final tie-in of pipe sections at foot of cliff at Iago, Coquihalla Canyon. Owner looking to leave town in a hurry. SERIOUS INQUIRIES ONLY. NO LOWBALLERS. BRING CASH. Okay, this ad is a joke, but the photos are all real. 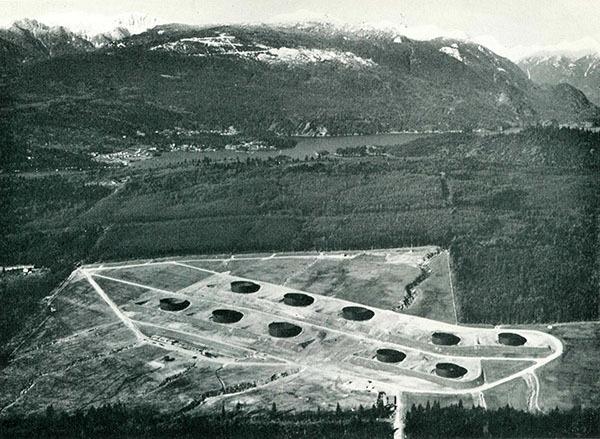 They come from a 1953 promotional book published by the original Trans Mountain pipeline company. Kinder Morgan bought the aging pipeline in 2005. The company has no plans to replace the now 65-year-old infrastructure. 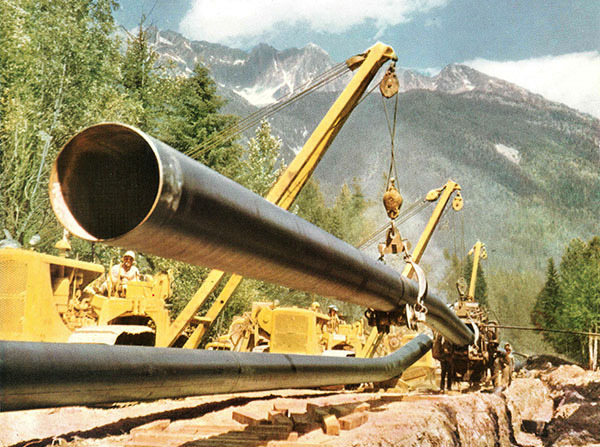 The proposed Trans Mountain “expansion” or “twinning” would simply add another, larger pipe across B.C., taking advantage of the existing right-of-way. This is the first time I’ve heard that the original pipeline is so old! I’ve heard about patching over the past few years but didn’t know the history. Thanks for letting us know. Brilliant composite of photos and text. Screw Kinder Morgan. Biggest assholes in North America, anything for a profit, who cares about humanity and life? Not Kinder Morgan. Shareholders rule. I’m concerned about a rail car spill of oil along the Fraser River. This would be devastating to Salmon stocks. Considering the age of the existing KM pipeline, I’m starting to think that the new proposed line might be in the best interests of the environment particularly if it could replace rail transport of fuels. Working directly for these big inch pipeline companies and being involved first hand in procedures and precautions taken I find this article to be nothing shy of amusing.You could compare many industries by the standards set 50 years ago. Times have changed, materials are better, more care is taken installing and maintaining these projects. All the benefits of petroleum with no pipeline? Priceless. I clicked on the link you provided and it says only 3 spills in the last 35 years have exceeded 1.5 cubic meters. If your own information is to be believed – there has been less damage to the environment from kinder in the past 35 years than the exhaust from cars in any major Canadian city on any given DAY! Meanwhile thanks to untreated BC sewage draining into the ocean, all of the scallops are dead, and the oysters are poisoned. BC keeps producing and burning coal, poisoning the land, fracking (poisoning the land and causing earthquakes) and blame everyone else for your problems! Don’t worry about the carbon emissions from Quebecs new concrete plant (which exceed those of the oil sands) and forget about the new offshore oil rigs from BP (lol remember that bp spill?) in Nova Scotia. Alberta. Yeah, with those pipelines. They are the villains….. (sarcasm). if this is no longer a KM asset and the pipeline becomes nationalized, what is your perspective then? I am interested in a genuine discussion. Please dont confuse the issues. the ownership makes zero difference….its still a disaster waiting to happen.